David Gilmour fans are getting a one-night-only opportunity to attend a theatrical screening of the former Pink Floyd guitarist’s historic performances in Pompeii. 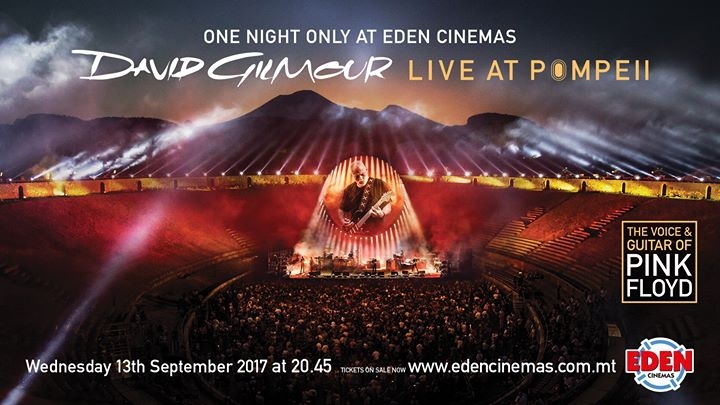 On Wednesday 13th September, 8.45pm, Eden Cinemas brings to you David Gilmour’s Live at Pompeii concert. ‘David Gilmour Live At Pompeii’ is an audio-visual spectacle, featuring lasers, pyrotechnics and a huge circular screen on which specially-created films complement selected songs, but paramount above all is the astonishing music and stellar performances from an all-star band. The show includes songs from throughout David's career including the title tracks of his two most recent No. 1 solo albums: Rattle That Lock and On An Island. Also included are other solo and Pink Floyd classics such as Wish You Were Here, Comfortably Numb and One Of These Days, the only song that was also performed by the band in 1971. Both concerts also saw very special performances of The Great Gig In The Sky from The Dark Side Of The Moon, which David rarely plays as a solo artist.